Can Jose Pirela Take the Reigns? From week to week, it seems that the Yankees projected 2015 infield has changed. At first, it seemed like we were going to have Martin Prado at third. Then, when they signed Chase Headley, Prado seemed destined to play second. Now that Prado’s been traded to the Marlins, it looks like Second Base is once again open for one of the kids. Now, Everyone and their mother has pretty much handed the job to Rob Refsnyder, but the team seems to want a competition between Refsnyder and Jose Pirela. What are Pirela’s chances of overtaking Refsnyder? Let’s find out. First of all, a bit about Pirela for you newcomers. We all met him last summer, when the Yankees called him up to replace Prado in September after Prado had to have an emergency appendectomy. 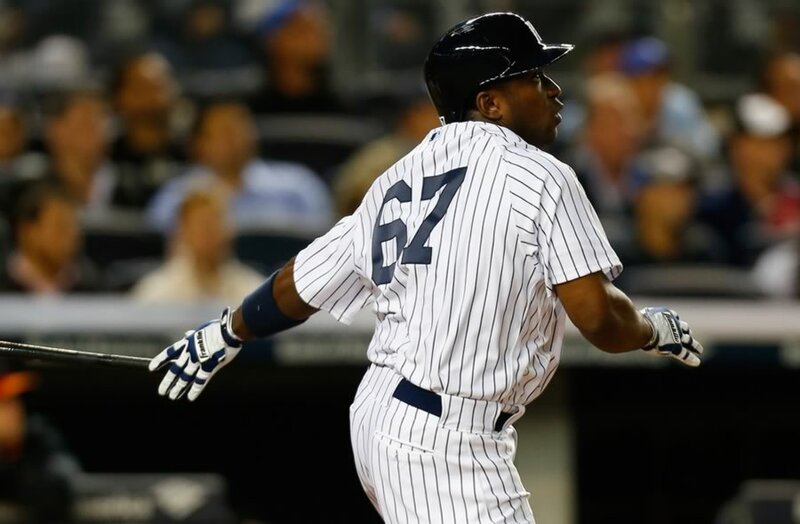 Pirela impressed immediately, tripling in his first Major League at bat and slashing .333/.360/.542 with a double, 2 triples and 3 RBI in his seven game cup of coffee in the Bronx (he also helped set the table for Derek Jeter‘s famous game winning hit in the Captain’s last home game). He had earned that call-up by hitting .305/.351/.441 with 21 doubles, 11 triples and 10 homers in 130 games for Scranton. He’d never really been considered much of a prospect until last season, but suddenly, here he is. Oh, he has also hit the cover off the ball in the Venezuelan Winter League this off-season, slashing .297/.398/.532 with 6 homers in 44 games. The moral of the story is that he can swing the bat a little bit, and that’s what could win him the job come March. The knock on Pirela is his defense. When the Yankees signed him as a 17 year old out of Venezuela in 2007, scouts said he had all the tools to be a middle infieldera, but those tools didn’t quite develop as everyone hoped. He’s not a complete liability in the field or anything, but he made 16 errors at 2B in 2013 and 6 more in 60 games last season, which isn’t ideal. I’m not sold on him being a bad defender just yet. Sure, he’s not going to be Robinson Cano out there, or even a Martin Prado, but I don’t think he’ll be costing the Yankees a lot of runs either. I just think there might be some growing pains to be had there. That being said, last year we had to deal with Brian Roberts, who was awful and had no range, so I’ll take Pirela any day. Plus, he made a couple of nice plays in September anyway, so who knows? The real question here is whether or not Pirela can beat out Refsnyder in Spring Training. I can’t really point to experience as a factor because Pirela had such a brief run in New York in 2014. That being said, Pirela has played 135 games at AAA and hit .305, while Refsnyder has about half as many games (77) hitting .300 at AAA in his career. If all else is the same, maybe the Yankees decide to hold Refsnyder back a bit at the beginning of the year to get just a little more seasoning, and roll the dice with Pirela on Opening Day. I really liked the way Jose played in September, and I think he probably deserves a real chance to win the job outright in Florida this spring. Either way, I think the Yankees will be OK at Second Base next season. One of the two kids will step up and win the job, and the other one will go to AAA to start the year. Rest assured, however, that we’ll probably be seeing both on the roster at some point in 2015 anyway.